After a devastating car accident, 40-something university professor Oh-gi wakes up to find his wife dead and his own body completely paralyzed in a hospital bed, capable of no other movement than blinking. His whole existence seems to have collapsed and disappeared into nothing, he says in a monologue. He is recognizable to himself only through a nametag that a nurse placed at the foot of his bed. 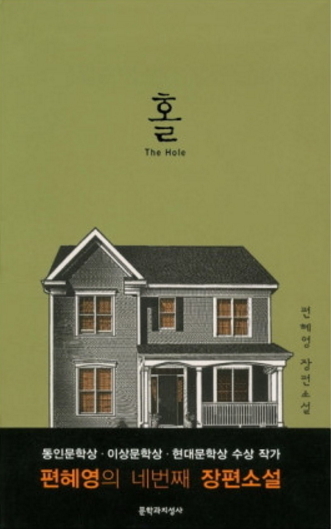 “The Hole,” the fourth novel of award-winning novelist Pyun Hye-young, dwells on themes of identity, control and will -- or lack thereof. Its reverse-chronological structure reconstructs the bits and pieces of Oh-gi’s life that have fallen apart, uncovering a gaping hole that has been there long before the accident. As he slowly recovers, memories of an affair and foul play creep back into Oh-gi’s mind. Flashbacks reveal his growing likeness to his father, whom he despised, and a wife whose remarks ruthlessly highlighted his ineffectuality. All the while, Oh-gi assuages his conscience and ultimately resigns himself to his own moral decline. The third person narrative that observes Oh-gi, whose name ironically means “refusal to give up” in Korean, adds to the story’s pervading sense of passivity. Since her 2005 collection of stories “Aoi Garden,” which illustrated a dystopia full of the grotesque, Pyun has been heralded for her dense prose and a “meticulously calculated ambiguity,” according to novelist Oh Jung-hee, that capture “life’s violence.” Pyun’s style persists in this disconcerting and often sinister story, and the reader is left wondering which is more devastating -- one life-threatening catastrophe or a million little surrenders in everyday life.